At Aestheticá, we believe that skin deserves to be nurtured, nourished and loved. At our beautiful Byron clinic, we focus on gently restoring and revealing your skin’s intrinsic beauty, allowing you to feel fresh and more confident. Aestheticá is locally owned, and run by a team of medical and dermal professionals. We have a deep appreciation of the techniques that achieve the best results, without causing undue stress or discomfort. This is reflected in the dermal treatments and injectables that we offer, which have been hand-picked for their effectiveness, reliability and safety. Far from being cold or clinical, our salon is a tranquil haven where you’ll be in the hands of skilled and trained professionals who take the time to get to know you personally. Whether you’re looking to smooth out worry lines, define your best features or regain a youthful glow, we’re here to help make your skin goals possible. Sustainability matters greatly to us – which is why we partner with Sustainable Salons Australia, a social enterprise that recycles or repurposes waste from salons such as ours. We also take care to ensure that all our products are responsibly produced, and none have been tested on animals. At Aestheticá, every member of the team brings different strengths and skills to the salon. What we all share: a genuine passion for skincare, and a close connection to the Byron hinterland area. A diploma-trained beauty therapist with a passion for skincare, Jade heads up our therapy team. Inspired to become a therapist after her own struggle with adult acne, Jade has a wonderful ability to understand (and empathise with) the skin needs and goals of her clients – and design treatment plans that are carefully tailored to each individual. Trained in a host of techniques including Dermaviduals and Cellbone therapy, Jade prides herself in achieving great results through an approach that’s effective, yet gentle. Born and bred in Byron Bay, she lives locally with her husband and two little ones. Having started her career in a busy Sydney dermal salon, and moving on to work as a skin educator for Dermalogica, Kristal brings a wealth of skincare experience to the Aestheticá team. She takes great pleasure in working with clients to understand their skin concerns and achieve great results – helping people to truly love the skin they’re in. As our Clinic Manager, Kristal is usually juggling several balls at once: managing bookings, exploring new products and treatments, and keeping the clinic running like a well-oiled machine. Luckily, as a busy mum of two, she’s skilled at multitasking. 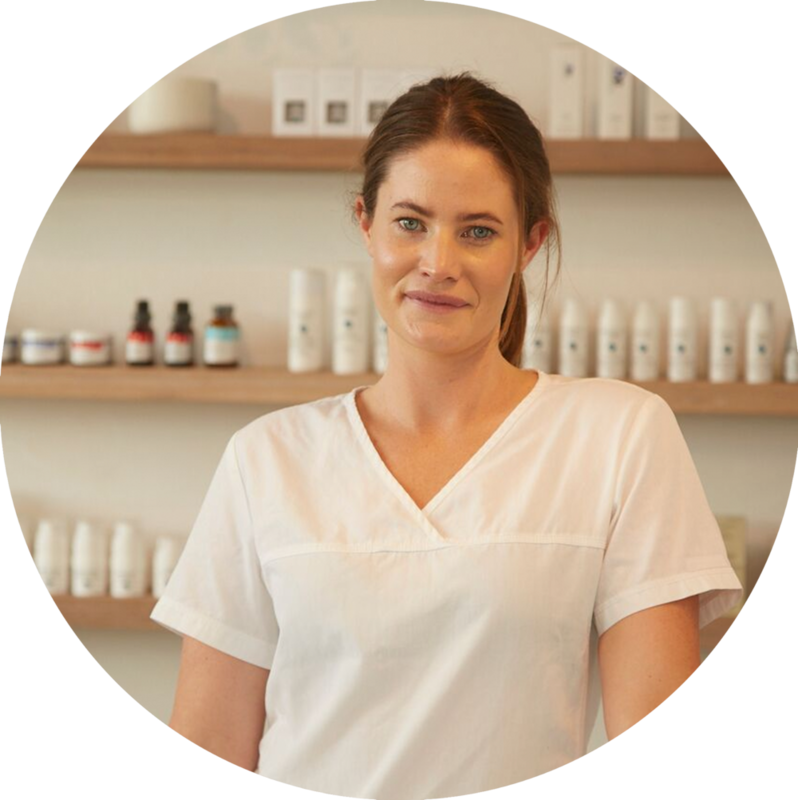 A registered nurse and AHPRA member, Alexa has over 7 years’ experience nursing – and is passionate about skin and using her specialised skills to help people feel happy in their own skin. With extensive training across all types of cosmetic injectables, Alexa is qualified by both Galderma/QMed and Allergan, and experienced in the art of PRP (platelet rich plasma) therapy. A firm believer that ‘less is more’, Alexa takes a holistic approach to her work, always mindful to enhance her clients’ natural beauty. A proud local, Alexa lives with her husband and beloved fur babies. A consulting doctor plays a crucial role in any top-quality clinic – and at Aestheticá, we’re fortunate to have Dr. Leigh McKenzie on our team. Having completed her medical training on the Gold Coast, Dr. Leigh went on to work across a diverse range of sectors, including surgery, general medicine, obstetrics and psychiatry. After returning to the Byron area, she brought her vast experience to Aestheticá, where she now oversees our treatments to ensure our clients receive impeccable quality of care. As a Member of the Australian College of Aesthetic Medicine, Dr Edwina is recognised as a highly trained Medical Practitioner. She is known for providing only the highest standard in quality care. With years of mentorship of many national and international specialists, Dr Edwina is experienced in the latest cosmetic techniques. Now she shares her expertise as an accredited trainer for Silhouette Soft Thread Lift. After completing a Bachelor of Science at UQ and Bachelor of Medicine Bachelor of Surgery at Bond University, followed by three years training in obstetrics and gynaecology, Dr Edwina moved into the area of cosmetic medicine. As a medical practitioner, Dr Edwina is passionate about women’s health. Driven by her work in the obstetrics and gynaecology field, studies in women’s health, and her cosmetic expertise, she takes a holistic view of her guests’ health and wellbeing. With years of experience under her belt and holding an advanced diploma of Cosmetic Dermal Science, Nakisha has always been passionate about skin. As a mega skin nerd she loves treating 'tricky' skin conditions and thrives on delivering fantastic results to her clients. Her approach is one that encompasses advanced technical knowledge with a relaxing and soothing touch. Nakisha believes that experience and knowledge is everything, this is why she takes time to listen and learn from her clients.